Sometimes you want a quick and effortless snack and you don't want anything sweet. Also the savoury options tend to be things like pastries which can be a bit messy, or breads which isn't that exciting. There has been a growing trend to sell these 'meat in a bag' style things that aim to fill that gap. 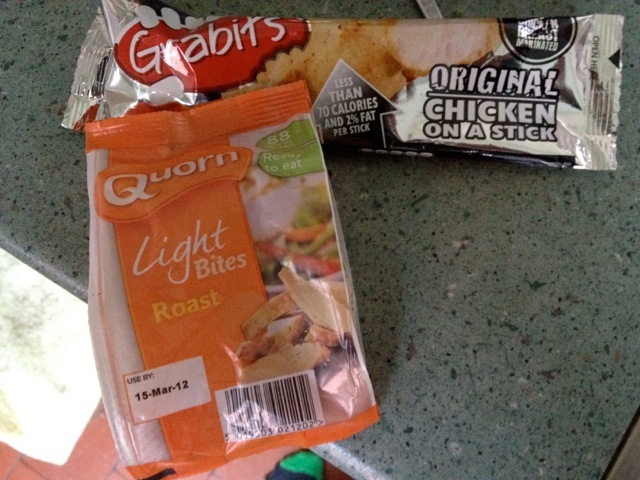 First up is Grabits Original (presumably the flavour) Chicken on a stick. This is exactly what it says - it's some cooked chicken on a stick. The portion is pretty good and if you got a skewer like this at a BBQ you wouldn't think too much about it. The flavour is nice and not that strong, and the texture is good and filling. The package says "produce of Thailand" and do not refreeze suggesting that the frozen chickens are more well travelled than most of us are, and it seems a lot of effort just to pop some meat on a stick in the fridge. I was pleasantly surprised by this though and once your brain gets past the part where its meat in a bag from the other-side of the planet it's quite enjoyable. The quorn option is a little different. For start off it's not actually meat, as Quorn is a kind of mycoprotein thing and suitable for both vegetarians and vegans (but not people who don't eat fungus - if they exist). It's a lot lighter in texture as you'd expect but the flavour is unnervingly close to that of normal bits of chicken. As most veggies I know aren't keen on eating meat this seems a bit odd. I think the target market is the calorie conscious but as the packets show - there are 18 less calories in the real chicken compared to the Quorn (although there is also 5g less stuff in the Grabits bag so it's actually 24 calories per 100g less). The flavour is much more thought out, there is a delicate herb aftertaste here that would work really well with a lunchtime salad and a bit of dressing - this is ideal for a packed lunch that isn't just soggy sandwiches. The pack size was about right for a snack, but I ate both of these products with 1/3rd of a can of baked beans and some humus so had them as a proper meal (although proper meal is probably a bit strong). I wasn't really looking forwards to these, expecting the meat to be tough and the Quorn to lack the excitement of when I stir-fry it up with sauces and noodles. Turns out that these are both decent enough options if you want a protein based snack instead of carbohydrates. Hmmm I have to admit, the chicken on a stick doesn't appeal to me that much, but I've had quorn before and was pleasantly surprised. I imagine it could be good to take quorn pieces to work, so you can add to a salad. I reviewed Grabits on Toto Eats the World with a similarly positive review. I tried the Quorn Light Bites; both Spicy and Roast variants - and felt they were nice but had an odd damp texture to them. I partake in a lot of Quorn products and it may well be because cooked Quorn tends to dry out somewhat, whilst these do not. Overall, I agree with you, though! I hadn't appreciated the moistness difference as I tend to buy the frozen quorn which is quite moist too. Glad to see the meat-in-a-bag thing is also odd to other people. Quorn isn't vegan - it contains egg white as a binder. They've released a vegan burger in the US though, I'm looking forward to seeing it here!